● Non-standard fasteners such as Torx, tamper-proof and unique screw head. Both vertical and horizontal serrations inside jaws fit the profile of screw head at the best angle to maximize the friction force and unfasten stuck or stripped screws without slip. 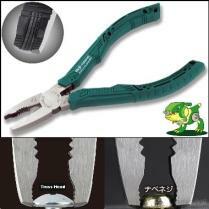 Also good for multi-purpose pliers for wire cut, twisting and gripping.